A strong presence on the internet is absolutely required for today’s real estate marketing. We combine multiple websites with very high placement in search engines as well as traditional marketing to provide your home with the competitive edge needed in today’s market. So when you’re ready to take the next step toward selling your home, we’re here to help. Our comprehensive marketing plan will get your home seen by thousands of motivated buyers. When listing your Glen Rose home for sale, establishing the correct listing price is crucial. Our market analysis accounts the most actively searched price points throughout your area, including sold listings, expired listings, pending listings, and active properties on the market. 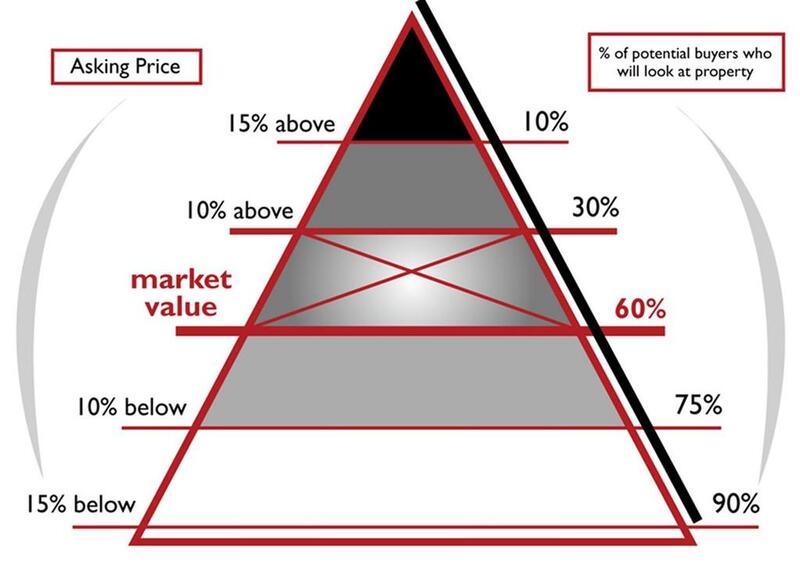 From the chart below you will see how important the list price is! In marketing your home, we also develop a listing that emphasizes its unique and sellable aspects. We then put your home in front of buyers, establishing it on the North Texas Real Estate Information Systems MLS® as well as on numerous real estate web sites ( REALTOR.com, Zillow, Trulia, etc.) , and real estate publications. Our nation-wide network of professional real estate contacts and buyers will also have the opportunity to check out your listing. In addition, we’ll use the Internet and our innovative website to make your listing highly visible. With more than 80% of buyers begin their search on the internet and that number is growing each year. New technologies and media outlets allow today’s real estate professionals to market listings to prospective buyers 24 hours a day, 7 days a week. But this is where all real estate agents are NOT created equal. Only a very select few actually have websites and other internet marketing avenues that allow your home to be found! We work proudly and diligently on our site, in effort to provide a comprehensive collection of Greater Glen Rose area information. SunrisePropertiesOfTexas.net has strong internet positioning with consistent top search engine rankings, bringing high visibility to your listing. You can reap the benefit of our internet experience, great front page presence and really powerful online marketing program which will allow buyers to find your home directly on the internet. Before you list your home, we invite you to check into the difference that our marketing plan can provide to you. You will be impressed at the amount of additional exposure that your home will experience utilizing a strategy that incorporates the latest technologies in the very place that we know buyers are searching. Many claim to be able to get your home “out there”, but we are one of a handful that can actually do it! When choosing a Real Estate Professional, it is important to choose a Realtor® with a vibrant and current online presence. Marilyn Phillips is proud of the online presence she has developed, and continues to be a leader in her field, while upholding the highest standards for each and every client. When you list your home with Sunrise Properties of Texas, you will automatically benefit from our use of advanced technology – not only our use of the internet, but our vast computerized database of buyers and our mastery of electronic communications and feedback. We will represent you through out the entire selling process. This process can get very emotionally charged at times especially during the negotiating process. We will ensure that you get the best price possible, and favorable closing terms that are clearly spelled out.